FLORIDA: Andrew Gillum Concedes To Ron DeSantis - Joe.My.God. 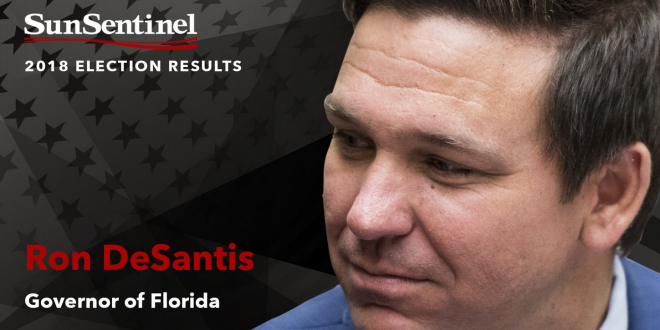 Republican Ron DeSantis has defeated Democrat Andrew Gillum, the young Tallahassee mayor who was vying to become the first black governor in Florida history, to keep the Sunshine State’s governor’s mansion in GOP hands. DeSantis clung tightly to President Trump, except when Trump advanced a conspiracy theory about the death toll in Puerto Rico after Hurricane Maria. DeSantis was also forced to disavow white nationalists who made racist robocalls attacking Gillum. The Democratic candidate won a lot of laudatory press coverage and was even buzzed about as a potential 2020 presidential candidate, but he was also weighed down by a corruption scandal in the city he served. Previous BREAKING: Democrats Have FLIPPED The US House!! !